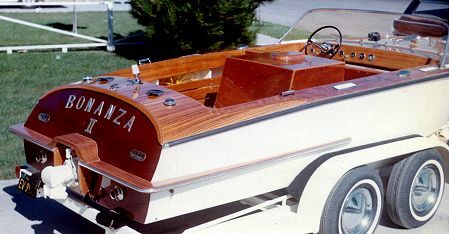 The distinctive styling of BONANZA's clipper bow and raked transom may remind you of the mahogany runabouts of the 50's. But she's more than a pretty face. The hull design incorporates the easy riding bulbous forefoot and reverse wave-dampening curve along the chine that we use on many of our large, high speed cruising yachts. Her shapely bottom is formed using double diagonal (cold molding) plywood in which two layers of 1/4" plywood are applied in strips. Sides are applied in sheets of 1/4" plywood. The motor is mounted in the center; the type of installation preferred by professional skiers. The reliable straight shaft inboard can be any automotive conversion, with great performance possible using a readily available small block Chevy. For those who want something more conventional, the plans detail a straight transom. But who wants to be conventional. 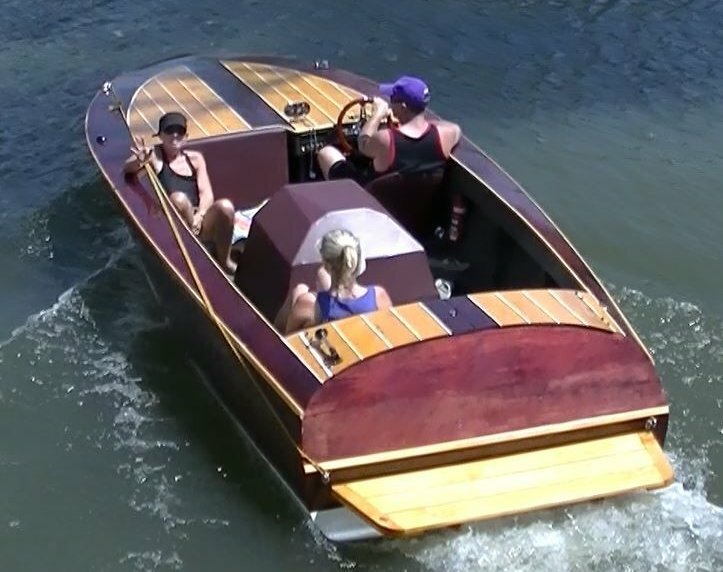 Add a mahogany deck and plush seating and start cruising your local aquatic boulevard. The un-conventional BONANZA will stand out from the crowd. She's a classic dreamboat that you can have for a non-classic price. Start building now and be ready for next season. "I have been building boats from your plans for over forty years and am pleased with your plans and help through the years. I built the Bonanza in 1975 and it is still going strong. 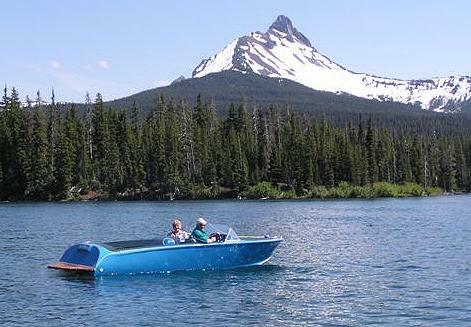 My grandchildren want to use the Bonanza instead of the fancy new boats of their parants. This Bonanza has a 350 chevy motor and has been very easy to keep up." Hull weight (approx.) 850 lbs. Hull type: Double curvature bottom with hard chine designed for double diagonal planking on the bottom and sheet plywood planking on the sides. Power: Centrally located inboard to 900 lbs. 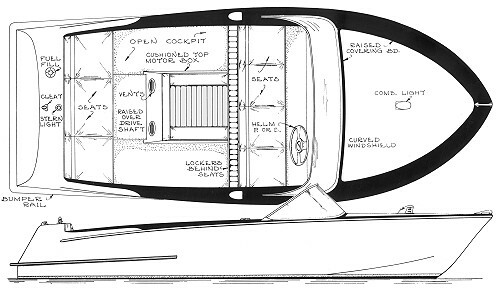 COMPLETE PLANS include FULL SIZE PATTERNS for stem, breasthook, chine blocking, and half-section patterns for the frames and transom. Includes instructions, Bill of Materials, and Fastening Schedule. Includes System Three SilverTip No-Blush Epoxy - best for a bright finish. CANNOT BE SHIPPED OUTSIDE OF THE US.